George Lucas is to be honoured at this year's D23 Expo. 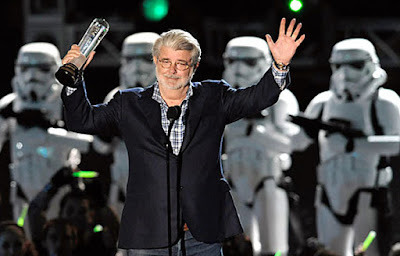 The retired Star Wars creator will be honoured with a Disney Legend Award, along with six other Disney Legends. The other six are GEORGE BODENHEIMER, ANDREAS DEJA, EYVIND EARLE, DANNY ELFMAN, SUSAN LUCCI, CARSON VAN OSTEN and JULIE REIHM CASALETTO. "The Disney Legend Award is our highest honor, and we are incredibly proud to recognize these eight talented individuals who have contributed so much to the world of entertainment and the Disney legacy. The Disney Legend Award is our highest honor, and we are incredibly proud to recognize these eight talented individuals who have contributed so much to the world of entertainment and the Disney legacy." No news yet on whether Lucas will be attending.